I want to know which type of altar I can build for a business like a restaurant,club, or bar to have peace and tranquility, draw good money, and keep away all types of problems. Which saint can I work with ? Last edited by Mama Micki on Sun Oct 07, 2012 12:08 pm, edited 2 times in total. Prosperity products are for business success, and boldo is used to keep bad customers away. Peace Water and/or Tranquility incense or powder could be used to ensure a peaceful atmosphere. St. Martin Cabarello (St. Martin de Tours) is traditionally petitioned by Latin American Catholics for business success. I am new to petitioning Saints. Each saint is a patron of something, such as St. Anthony for lost things, St. Expedite to get quick results (esp. with financial concerns). When a petition to a saint is successful, but you now need/want to petition another saint for something else, what might be recommended to do with the picture/statue of the other saints on the altar, but who are not being directly petitioned? Would you place them to the back, put them elsewhere other than on the altar? I am thinking that even if they are not a patron of the same thing as the saint you are petitioning at the time, they may still have some input or help, and so perhaps it might be best to leave them on the altar, but maybe to the side of back? Also, in-between workings, can you light just one candle (white) when thanking the saints you worked with, or would separate candles for each saint be more appropriate? It's been said before, but it's worth mentioning again, that working with saints is not a common practice in Hoodoo. The majority of rootworkers are Protestant, which explains why the veneration of saints is not a common feature. Online, working with saints in the context of Hoodoo is disproportionately represented. Oftentimes the "working" relationship with saints is given more attention than the devotional relationship with a saint, often removing them from their Catholic or Orthodox cultural contexts. This is of course not to say that non-Catholics cannot petition the saints: anyone can. However, one should expect (as Miss Cat mentions in one of the above posts) that a non-Catholic would have a deep appreciation and respect for the Roman Catholic (or Orthodox) Church and be willing to learn about the veneration of saints from someone of that culture. As an aside, I'm not singling you out Caedryn; you may be Catholic for all I know. I'm just writing for everyone's benefit. Since you are new to petitioning saints, I encourage you to familiarize yourself with the role that saints play in the Catholic Church, particularly the doctrine of the intercession of saints. Take advantage of the wealth of information about the saints available online: the Catholic Encyclopedia and Butler's Lives of Saints are both great places to start. Speak to Catholics about how the saints have impacted their lives; many Catholics have an interesting family story there! Understand that petitioning the saints is one part of the larger Catholic folk magic tradition. Learn from Catholic folk magic practitioners about the use of priestly blessings, sacramentals like holy water, traditional litanies and novenas, the use of different prayers like the Rosary, etc. That's really the best way to learn about and work within a certain tradition: from the people who are a part of that tradition. The reason I'm saying all of this is because working with the saints has increasingly taken on a "gum ball machine" approach. Have a problem? Petition such-and-such saint, get what you want and move on. Again, I'm not suggesting you would this, but it is all too often the case. So familiarize yourself with the Catholic tradition. If you find that you are unable to work within that tradition, then perhaps working with the saints is something not suited for you. Most saints are fine sharing the same space on an altar. If I'm not actively working with a saint on my altar, I just leave them where they are. To me, an altar for the saints is not just a place where I perform magic, but it is also a devotional space where I engage in spiritual practice. Depending on your altar space, you may be able to undertake the work or "spell" directly in front of that saint's statue or icon while still having enough room for other saints. If not, adapt to your space needs. There are sometimes exceptions. As a personal example, Santisima Muerte and the Archangel Michael each have their own dedicated spaces. This is because I believe them each to be such powerful and holy spiritual beings that they deserve their own spaces for honouring them. If you decide that your relationship with a particular saint has run it's course, the traditional and respectful way to pass on their statues/icons/prayer cards/etc is to take them to a Catholic church and leave them tucked under the pew or in a corner of the church. There is separate protocol to be followed if the item was a sacramental to prevent desecration. Finally, in between workings, I love to light a single white candle dressed with Lucky Mojo All Saints oil, as an offering to all the saints I have a relationship with. Sorry for the long-winded reply, Caedryn. My intention is not to sound "dogmatic" as it were, or like I'm policing how people work with saints. I sincerely hope you, and anyone else new to the saints find it useful. Tristan, thanks for that thoughtful and helpful response. You mentioned the interesting fact that Catholic would-be-hoodoo practitioners are disproportionately represented online. I agree. I think what we are seeing is White Catholic interest in African American hoodoo plus Latino Catholic interest in African American hoodoo doubling up and tending to make it appear that Protestant hoodoo has a Catholic background -- which it does not. I look forward to the day that someone with a deep, honest, respectful, inquisitive, historical, orderly, persistent, and educational turn of mind starts a site devoted to Catholic folk magic, so that Catholic folks will have someplace else to go, instead of always coming here and trying, by sheer weight of numbers, to turn Baptist hoodoo into a Catholic tradition. Here, courtesy of the First Baptist Church of Mt. 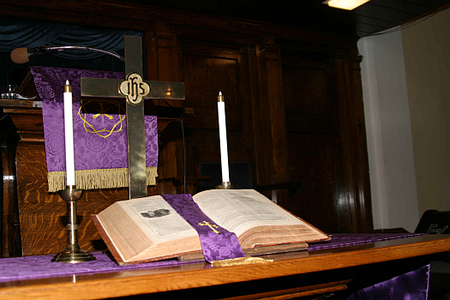 Gilead, Ohio, is a picture of a typical Baptist church altar, on which the Bible occupies the position of honour. Hi Tristan. Thank you for the reply. It helped. Before I begin anything, I research it as much as I can, based on what is available to me. I posted here, because, although I found much, I did not find the material I was looking for. You supplied it, so I came to the right place . One thing about me, is I don't use people, and that includes Saints. I expect to have a relationship with them beyond just "needs". People mix all kinds of deities. You see it on this site - RC/Protestant Saints, Hindu Gods/Goddesses, Chinese good luck creatures, etc. all on the same altar. In other words, it would seem many people work with what they are drawn to, without getting overly involved in the specific religion or working 'precisely' according the tradition/religion, unless they want it. Another way of saying what I mean, is that a person does not have to 'convert' to that tradition/religion in order to work/have a relationship with the deities of that particular system. My belief, is that Saints would want to help a person, regardless of religious denomination, if they are sincere, genuine, and work within what the Saint would be willing to do, such as St. Dymphna compared to St. Cyprian. Also, I think someone can work with a Saint, even though they are not RC or Protestant, but are petitioning the Saint for someone who 'is' of that religion/tradition. But, that is just my opinion, but it has worked for me and a person I did a working for. You’re very welcome. I too look forward to the day when there is a proper place for Catholic folk-magic. At present, I think the Lucky Mojo Curio Company and the forum are simply the best places for discussion and information on folk magic in general. That’s why we get everybody. I think your assessment on the misrepresentation of Catholic influence in Hoodoo is spot on. However, I am personally unsure of how many of these people are actually even Catholic or have learned from Catholic folk-magic practitioners. Who knows? I’m glad my post was helpful to you. You certainly seem like someone with a level-head on your shoulders and I think you have shown knowledge and respect. I think we can agree that the question is not one of belief. Maintaining orthodox religious belief is a private matter, and one which we respectfully don’t discuss in the forum. A person certainly does not need to convert to Catholicism in order to have a respectful and beneficial relationship with the saints. So the question is not, “Who can work with the saints?” or “Must I be Catholic to petition the saints?” Rather, I think it’s “How can one work with the saints in a way that respects the culture, tradition, and religion that they come from?” In a nutshell, it’s not about the Catholic faith and conforming to it: it’s about Catholic folk-magic and understanding that it is inseparable from Catholicism. That you say you expect to have a relationship with the saints beyond your needs is certainly very commendable. Unfortunately though, it’s not something you see very often in practice. People get out their prayer card of St Expedite when they’re short on cash, and once he’s come through, his prayer card goes back in the sock drawer. It saddens me, really. As far as mixing deities and saints from different faiths, I think it’s a private decision. But one would hope, for example, that a Hindu deity would be honoured with a puja out of respect just as a Catholic saint would be honoured with an Our Father and three Hail Marys. That, at least, is my humble opinion. Yes, I agree. Then there are different folk catholic practices, depending on country. This thread continues to be a source of great conversation and advice. Thanks to all the recent posters and insight. On a purely academic note, the sudden influx of interest in Catholic saints results really from a variety of things in my opinion. 1. An influx of Catholic and/or Latin American practitioners coming to hoodoo. These individuals are adopting hoodoo practices with their own religious beliefs. 2. Neopagan practitioners new to hoodoo. These folks often find the intercession of saints more comfortable than the Protestant Christianity of hoodoo which calls upon God directly. All made possible via the internet. ...on an alter? I want to do my alter so that it is pleasing to GOD and the spirits...but I don't want to either overdo it or under do it. Thoughts? What should I concentrate on? How much is too much or too little? Altars are sometimes best made over time. You might start a little space that's little more than a glass, incense holder, candle holder, and bible. There's no rule about how much should or shouldn't be on there so long as you keep your space clean and sacred. There's no need to go out an buy tons of things for it so that it looks or seems more like an altar space (unless you're working with specific spirits who have requested specific things). If something jumps out at you as being appropriate for your altar then get it. Otherwise, I wouldn't worry too much about it. The only practical suggestion I can make is to have things like a candle snuffer and box of baking soda (in case of fire), and any other tools or oils that you might use for it near by. One of mine is an old table with a handy drawer, for instance. This way, for aesthetic reasons, I don't have to have lots of things on the top or far off in a different room. Working altars, on the other hand, I'm not as picky about as they're out of plain view. They should still be fairly clean, but I don't mind bottles of oil or other tools on those so long as they don't interfere with the setups. When performimg candle spells, honey jars spells etc. Do I need a special room or can I use a closet to do my work? How big should my alter be? I have a big family and is temporarily living in an apartment, but I need to do work so that I can balance my home and family, a couple of life changing events are occuring. I do have my bedroom and a closet to work in so that my work is not disturded. How can I do this in order to get good results without interuption. green5, do the best you can. You can store your honey jar in a closet if necessary. Take it out to burn the candles. The four inch candles that are normally used with a honey jar burn in a about two hours. If you want to set up a more permanent altar, a small dresser or nightstand will do. It does not have to be elaborate or large. A candle holder, an incense burner, and some type of spiritual image, such as a picture or small statue, will get you started. Thanks Mama Miki, I think that I would want to create a permanent alter. I have had this spriitual calling for years, so now I have more time and can financially indulge in my spiritual education and practices fully I will create my ritual alter. I am so glad that I can look to Lucky Mojo Forum for advice, you guys are really helpful. Thanks again. I often read how people have set up an altar for St. Expedite, or an angel altar. Is it better to have separate areas , ie. a money altar, one for saints, one for my career , one for healing, for it to be more effective? I have an altar with different tiers, and I separate my areas like that. I am wondering what is the best way to get the best results. Would I be going outside of hoodoo tradition by having more than one hotei buddha on a money altar? I just recieved the mexican pregnant with cross of caravacca buddha (which is amazing) and I now have 3 hotei on my very small money altar. It may sound silly but I started thinking if I have more than one do I need to give all 3 of them attention by asking them each for prosperity and rubbing each of their bellies? I'm almost embarrassed to ask such silly questions but I'd rather know and be doing it right. These are questions that only you can answer for yourself. I would personally attend to each "statue" individually because that is what I do. My altars are one whole "entity" but each piece on the altar is important and tended to. You may feel and work differently then I do...many have their own way of doing this. Pick a path and see what works. 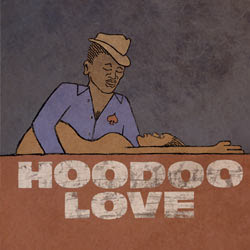 Hoodoo tradition is varied. The hotei buddha are not included in Traditional Hoodoo (important capitol letters) but used by many who practice hoodoo. Do what works for you and you can't go wrong. stargirl wrote: I often read how people have set up an altar for St. Expedite, or an angel altar. Is it better to have separate areas , ie. a money altar, one for saints, one for my career , one for healing, for it to be more effective? I have seen as many different altar set-ups as I have seen practitioners. Everyone's will be different and personal to the person who made them up. I, personally, give each specific entity their own altar space, completely separate from the condition altars I have set up. The system of magic that I use the most, follow, research, am concerned with the most, and get the most results from is hoodoo...however I also have Lord Ganesha in my life, Santisima Muerte, etc AND use non-traditional workings, objects, and ingredients. What counts is that I am well aware of what is Traditional and what is not and I do not try to force one category to take over the other. I personally see Hotei in a category of spirits that are non-local, spirits that are not restricted to one place or object. I have more than one statue of Hotei and I do not attend to every single one, though I do eventually do something special for ones I haven't attended to as much. Never had a problem or issue with this method. Read it over and you will be inspired and further informed. You are most welcome. Good questions! You are most welcome. Best of luck to you. Keeping this short and sweet. I have been using a portion of my bureau in my bedroom and dedicated this part specifically for a Saint. I physically clean the section off every few days with florida water. Now, my question is, because I really have no other place to give offerings and light candles and what not, would this be considered disrespectful? I mean, I still have my own stuff on the bureau (hair products, perfumes, jewelry, etc). I dont have a much, just a plate that i light candles on daily while I talk to her, a crystal bowl with petitions under (for the 9 tuesdays) and her prayer card and her water. Have you read this thread from start to finish? If so, you have your answer already. It is very common among African American hoodoo rootworkers and spiritual practitioners of a churchly sort to keep altar work on a nightstand, vanity table, dressing table, bureau, chest of drawers, or chiffarobe. In particular, on PAGE 9 OF THIS THREAD you will see (or would have seen, if you had read the thread) some photos that would have answered your question quite explicitly. Here is yet another picture of Ella May Watson's altar on her vanity table, taken by Gordon Parks. If a picture is worth 1,000 words, then look at this picture, go back to PAGE 9 OF THIS THREAD and you will multiple thousands of words. 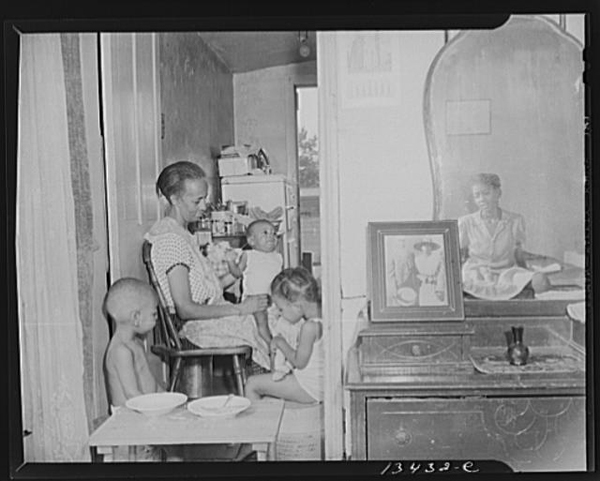 1) Ella May Watson, with her adopted daughter (in mirror reflection) and three grandchildren, Washington DC, 1942. This vanity is not being used as an altar and is probably in the room of her adopted daughter. Photo by Gordon Parks. 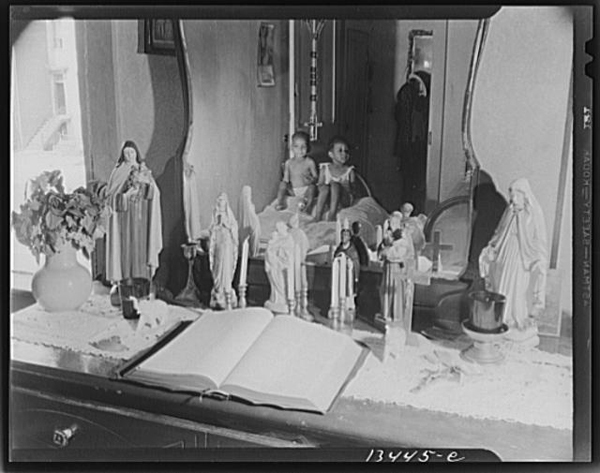 2) Close-up of Ella May Watson's vanity table, with her grandchildren reflected in the mirror and her altar of saints, an open Bible, and a lucky trunk-up elephant on display in her bedroom, Washington DC, 1942. Notice that the altar layout is different in this photo than in the one one page 9 of this thread. This was a WORKING altar and she moved candles and statuary around to serve her purposes. Photo by Gordon Parks. By the way, Ella May Watson was not a Roman Catholic. She was a member of a Saint Martin's Spiritual Church -- that is, she was a Spiritualist. The Saint Martin in the name of this Spiritual Church is Saint Martin de Porres, the first Black man made a saint by the Catholic church. 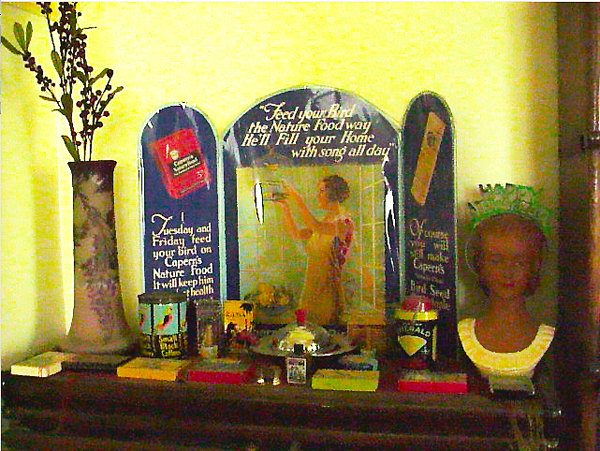 His statue is the fourth one from the left on Ella May Watson's dresser table altar. 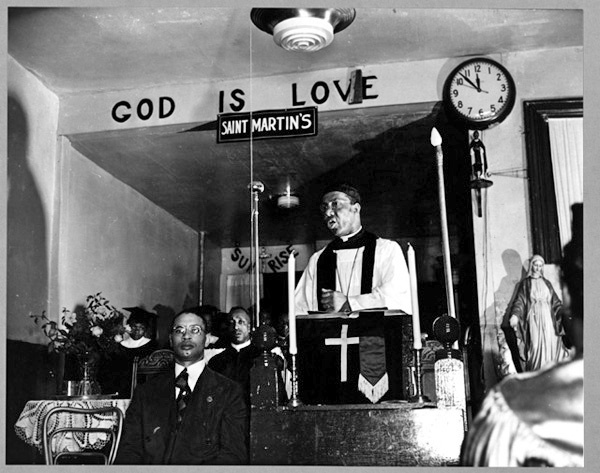 Saint Martin's Spiritual Church was part of the Spiritual Church Movement, a loose confederation of Judeo-Christian and primarily Black Spiritualist churches organized into denominations such as the Colored Spiritualist Association of Churches, Metropolitan Spiritual Churches of Christ, and Universal Hagar's Spiritual Churches. Thank you Miss Cat for posting these wonderful pictures. Hi everyone, I live with my parents and unfortunately I don't have much privacy even in my own room. So I wanted to pray to St. Martha for 9 Tuesdays and light candle and offer a bowl of water (from our filter not tap) but I can't have a permanent alter. Would it be ok if I placed a white towel on my vacuumed carpet, print St. Martha's photo and place on it, light a candle on a white bowl as well as offer water in white bowl every Tuesday? I would have to uneasemble this after my prayer so mom can't see them the next day. Would this offend St. Martha? If I can do so, where do I put the offered water for that Tuesday? I'd use the same photo every Tuesday, right?! Temporary altar spaces like the one you are describing are often used for more discreet work. When work needs to be hidden, sometimes working in a closet on the top shelf can be an alternative as well (care-ful about the fire hazard there though). If you want to be sure the Saint is OK with this arrangement, you can always do a quick pendulum divination on the matter. Details to consider however: see about finding a nice scarf or handkerchief rather than a towel if at all possible. 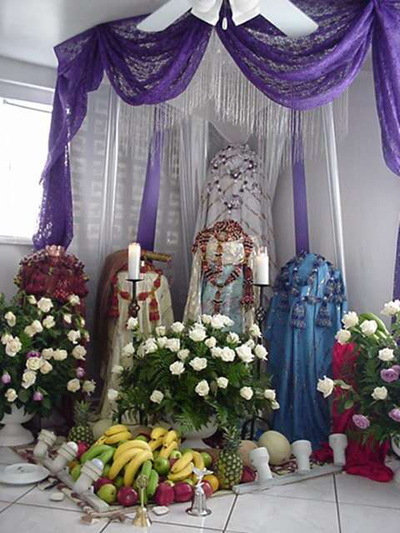 1) With respect to disposing of foods left on the altar, you should familiarize yourself a bit with altar work in general, as many of these customs are more or less the same from one religious culture to another. 2) With respect to changing candle colours utilized in honour of a particular spirit, saint, or deity, i think that until you become wise in a tradition, you should follow either a teacher or the opinion of mature people who were raised in the tradition. Do NOT try to get a random "vote on the internet" when it comes to learning a religious tradition that is new to you. 3) With respect to deciding to substitute one oil, herb, or bath for another, i would suggest that while it is not wrong to work also with your own inner vision and sight, if you are joining an extant and living tradition, you should always ask for personal instruction from a stable, mature person in the tradition whose reputation is good and who has been in the tradition for a long time. Do not let either your eagerness to serve or your prideful egoism lead you into opposition to or isolation from the very tradition you are seeking to embrace. catherineyronwode wrote: Another way to set up altars -- and limit them to two -- is to divide your spells into two basic types, those of increase and help and those of decrease and removal. If you do that, you can work all spells of increase at an altar that faces East ("As the Sun rises, bring to me xxxxx") and all spells of decrease at an altar that faces West ("As the Sun sets, remove xxxxx from me"). The two altars can be on two sides of the same room. I face east when i'm sitting before the altar or the altar faces east? Altars are facing the directions (east for increase, west for decrease) and while working the altar you are facing in that same direction as well. I know this question might be a little base, but here goes. I'm preparing to set up a working altar for our home. Actually, I'm setting up two - one is more or less for prosperity and the other to venerate and work with my ancestors. Before anything goes on the altar, is there a special way of blessing it and dedicating it to its purpose? I've read about using condition oils to dress it in the four corners and such, but if some of you seasoned practitioners could share your ways with me that would be wonderful. Hi Sweetgrass Moon. I've moved your post to an ongoing thread about the topic of Altars. Be sure to read through the previous pages for you are sure to find some great insight. Thanks Papa Newt, I didn't see this section before! So I want to set up an altar but I've run into some problems. I was looking into taboos and the best way to set up an altar and the way my "room" is set up violates a lot of alter beliefs I have and I do not have accessibility to a variety of items that I would commonly put in an altar. My situation is that I live in army barracks and we are not allowed to have anything that heats up in our rooms, such as microwaves, ovens etc., so I can not get incense or candles, anything like that which one of the largest parts of my previous altar. I have a lot of imagery, though. I also can not have any "weapon" like items and the shop here is very small so there is not much to choose from. My altar will have to lie above my study area as I share a room and that is the only free area I have left. The corners are sharp and high and it is across from the toilette. Which apparently is just a no no. Lol. It's also not in the appropriate direction of the room but it's all I have to work with. I need some Ideas on what to purchase for my room and ideas on how to set up my altar in accordance to elements blah blah. So far I have mirrors, plants, bowls and if there is an assortment of stones in the stores here some stones. The ones particular to my deity are unavailable so I was wondering What kind of plants and stones would I need to purchase for common elements and feng shui for each corner of the altar and any other altar item ideas. Last edited by Doctor Hob on Tue Apr 16, 2013 10:59 pm, edited 1 time in total. First and foremost, the word, in this context, is "altar", not "alter". I corrected the spelling in your post, as that is a peeve of mine. Next, from the language you're using, I take it your methodology is set in some form of neo-paganism. That's swell, but this forum is about hoodoo, which is an African-American tradition of folk magic, with strong roots in Protestant Christianity. A good many hoodoo practitioners employ altars. Many maintain altars to their ancestors, and to saints, or divinities to which they are acquainted. Many professional workers keep multiple working altars, for assorted types of jobs. In my experience (and personal practice), these altars don't have the strict requirements you seem to feel that you have to adhere to. There's nothing wrong with those requirements, if they suit your practice, but this may not be the correct place to find information on those types of altars. On a practical level, maintaing a formal altar in an Army barracks is likely an exercise that will bring you little besides frustration. You can surround your personal space with such items as bring you devotional comfort, but some type of portable altar would probably be more useful than a large, free-standing one. I've seen devotional altars built inside cigar boxes, that were both beautiful and functional. At that size, you could not only bypass the space issue, but you could throw it in your pack, and hump it along with the rest of your kit, when you're on the move. You can include substitutes for items that you either can't find, or aren't permitted to have. Much good magic has been carried out with a pencil for a wand. When you have your own space, build the altar you want. Until then, get by with the altar you need. Most hoodoo practitioners have altars if they can, but one can also use things like mojos, oils, powders, and baths, which do not require an altar. If you can't burn candles or incense, just set up a place with spiritual pictures, statues, and other things that are meaningful to you. I live with three others in a house and have my altars set up in my bedroom. I have four different ones set up as I do not have the privilege to set them all around the house! Someone told me this was a really bad idea. Is this true? Is having an altar or several for different purposes in your bedroom a bad idea? I just really need to confirm this as I do work every day and need to be sure. Many people, including myself, have bedroom altars. I don't know who this "someone" is that criticized this practice, but you would probably benefit from asking experienced practitioners about these matters. For generations, hoodoo was practiced by people who essentially lived in one room. I would say it depends on you and your perceptions of energy. If the work of the spirits is keeping you awake at night, then there's a problem. But it sounds like that's not the case, if you didn't "know" it was a "bad idea" until someone said so. Many of the oldest spells don't involve altar work, anyway: loading sugar bowls, fixing people's food and grooming supplies, wearing a mojo bag. I actually have no problems having them in my own room and will continue to do so! The topic of altars in the bedroom has been covered in this thread several times since the Lucky Mojo Forum went online 2008. Reading this thread from the beginning will help you place the issue in the context of African American American Hoodoo folk-magic, which is the subject of the forum. You will see many replies, some of them from a standpoint of experiential knowledge, others from a cultural traditional perspective. Here is one of four altars that my husband nagasiva and i maintain in our own bedroom. This one is the "bird altar," so called because it features several images of birds. When all the unpacking is finally done, after our big move. I believe we are going to have an altar in every room of the house, and a independent temple outside the house with more altars. The topic of altars in the bedroom has been covered in this thread several times since the Lucky Mojo Forum went online 2008. Reading this thread from the beginning will help you place the issue in the context of African American American Hoodoo folk-magic, which is the subject of the forum. You will see many replies,some of them from a standpoint of experiential knowledge, others from a cultural traditional perspective. Many thanks! The thread covered all my questions. I am doing my first spell. (Black candle separation spell) I am hoping for my items to come in next week. I have never done this before so I have several questions. 1-is it okay for me to do my spell in the garage then hide it in a rubber made tub so no one sees it? 2-since I'm trying to separate my ex boyfriend (father to my baby) from his new girlfriend, which way am I suppose to sit when I do this? I kept seeing comments of east and west. Since its about them, does this not apply to me? Thank you all for your patience with me. No one knows I'm doing this, this isn't something that I can tell anyone due to them not agreeing to this. I know no one who does this. I can't even find a shop here to buy things I have to order online. Thank you again for the help. 2 - For cursing, many prefer West as this is the direction of the setting sun and it takes things away, breaks them apart and removes them. It's a good direction for banishing work. That said, there are a number of schools of thought on directionality and not everyone works the same way. Since it is your first spell, you may want to consider getting a short magical coaching session to walk you through the work and the details you're curious or unclear about. It can really give you a better sense of the work and the type of spell you're doing in general. Most AIRR members offer magical coaching. Thank you aura you have been very helpful! I do have a reader who is an airr. I just always feel bad emailing her. =\ I don't want her to feel like I'm a pain in the tush!! If you pay for a magical coaching session you'll be far from a pain in the tush for your AIRR worker! You'll be helping them with their livelihood They can probably also give you excellent information on how to put up a portable altar as well as what to keep on it. You can read this thread, pre-pay an AIRR worker for magical coaching, email the worker pictures of your proposed altar space and the items you are thinking of having on the altar, and then set down at your appointed time to a half-hour or one-hour session of instruction. If you choose an AIRR worker who will do skype video conferencing, you can actually do the work of setting up your altar in real time! Greetings everyone. I am curious to know if on my altar I can have a series of conjures going but for different purposes? For example, I assume its safe for candles for positive work to be near each other on my altar, but the candles going for negative/destructive work should I quarantine them to a separate space? Or as long as the candle remains I plan to keep and those that are to be disposed of dont mix, it's cool? I have a very limited amount of space and I have been hesitating from doing destructive work because I didnt want the intents to "mix". Any views would be much appreciated! Brother_Brad wrote: I have a very limited amount of space and I have been hesitating from doing destructive work because I didnt want the intents to "mix". First of all, an altar doesn't have to be a dresser- or table-top. You can just as well burn a dressed candle on a little wall shelf or sconce. Some folks burn negative candles on the back of the toilet (a faint echo of the days when they would be burned in the outhouse and then, partway through the burn, knocked into the human waste below). Some folks burn candles (of any type) in the bathtub, especially when they're not home; it improves fire safety, too. Secondly, not every spell is a candle spell. Are you working a dollbaby on a thoughtless or reluctant lover? Keep it in your underwear drawer between sessions. Are you working a vinegar jar to break up a couple? Shake it, don't burn a candle on it. Hide it away between sessions. Are you blindfolding a doll baby to keep someone unaware of your work? Keep it in a black bag in the closet. Do you need to sweeten a family member? Wrap your herbs in your petition paper and tape it to the bottom of your sugar bowl. Do you want your sweetening work -- say, an apple spell or honey jar -- to keep humming along quietly in the background for months or years? Put it under a plant in your garden next spring. Miss Michaele gave great advice. If someone told you that you must use separate altars for separate types of work, that's wrong. Read the material in this thread. Read the material on altars at the AIRR site. Get in touch with other practitioners and listen to them. 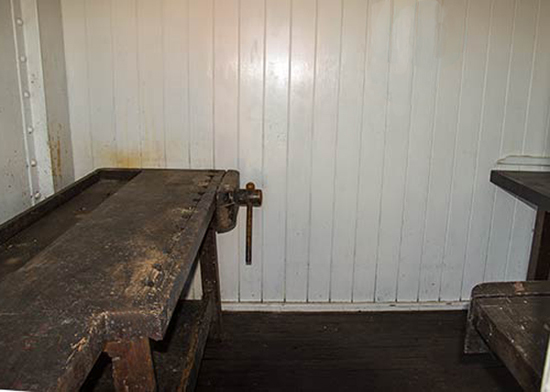 One of the best workers i knew placed all of his spell work for clients on an old-fashioned built-in wooden carpenter's bench in a room in the back of his candle shop, which had obviously at one time been a carpenter's shop. Now, this man was a PROFESSIONAL root doctor. He had everything on the one altar. He kept things at different parts of the workbench, not all mixed together, but there were no clearly demarked "territories" on it. It was a mess, too. Wax everywhere. That was HIS STYLE. And i never questioned him about was this a bad idea or not, because he obviously knew his business.